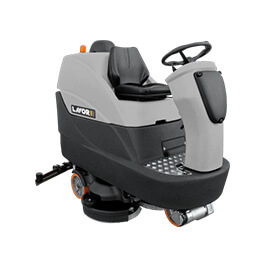 Suitable for maintenance and deep cleaning of medium and large areas (up to 6,000 m²). More than 90/120 kg of constant pressure on the brushes. Large load capacity tank, resulting in reduced number of stops and maximum use of battery charge for effective operation of the machine. Stability even when fully loaded. Independent Front wheel-drive with tight steering radius. Automatic brush plate lifting system. Automatic squeegee squeegee lifting while reverse going. Automatic control system for brush rotation and detergent water out?ow. High-performance batteries resulting in high working efficiency. The unique anti foam device dramatically reduces the foam generation and prevents it from touching the suction motor, thus protecting its operation. The electronic switch roating stops suction when the tank is full. Large tank opening for fast and easy cleaning and sani?cation. The strong V-shaped squeegee made of steel ?oor pro?le is widely adjustable and allows to combine the operation of the rubber blades with the high suction power, to get a perfect drying result on every surface. The special box alter retains solid debris and prevents the obstruction of the suction hose. The scrubbers are easy to use thanks to the simple and user friendly controls. From the control panel the operator can adjust the maximum forward speed and the quantity of cleaning solution out?ow, selecting the options most suitable to the dirt type. Job is simpli?ed and made faster by the automatic lifting of the squeegee and of the brush plate. Thanks to the optimal weight distribution and to the use of strong oil-proof polyurethane wheels the drive is perfect in all working conditions. The emptying of the water tank is quick solution with a simple and easy accessible mechanical tap. BLADE Front squeegee blade L.1270 mm 4 mm 40 Th.